The marathon is finally over and just as those brave enough to run those things can probably attest, it’s a relief. 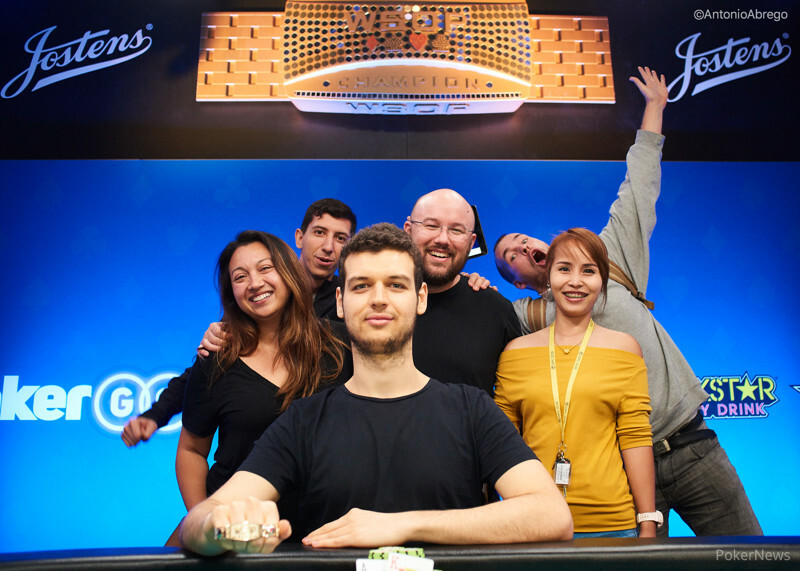 Five long days of 100-minute blind levels came to a close and Australia’s Michael Addamo was able to claim his first gold bracelet in Event #24: $2,620 THE MARATHON No-Limit Hold’em, along with his best live cash by more than three times. The Australian, who recently relocated to Thailand when online poker was banned in his home country, won $653,581 for outlasting the field of 1,637 runners. He adds that to his already more than $1.3 million in live earnings plus plenty of online success. After getting through some seriously tough competition with the likes of 2014 WSOP Main Event champ Martin Jacobson, bracelet winner and WPT champ Taylor Paur and Belgium’s Bart Lybaert from five-handed on, Addamo had to face off against recreational player Mark Sleet. It was an interesting battle with underdog Sleet giving Addamo a run for his money. “He was mixing it up, trying to put me to the test, like opening big sizes, doing all sorts of different things, trying to get me off my normal game. I think I adjusted ok but yeah, who knows,” Addamo said of the heads-up. The final day of the marathon saw a talent-packed nine players returning on Friday to play down to a winner on the Brasilia Twitch stage. It was a deep-stacked final with only three players between 20 and 40 big blinds: Cate Hall, Ying Chan and Anton Morgenstern. Everyone else started the day with at least 96 big blinds. In the first level of play, Ihar Soika, playing in his second final table of the series, busted in ninth place. It was a tough hand where he turned eights full with pocket eights, running it smack dab into the top boat flopped by start-of-day chip leader Sleet, who held pocket kings in the hole. Hall remained patient as one of the short stacks early, and eventually got the rest in with pocket tens but ran them into Addamo’s queens. The board ran out with quad fives and Addamo's queen kicker played to send Hall to the rail in eighth place. 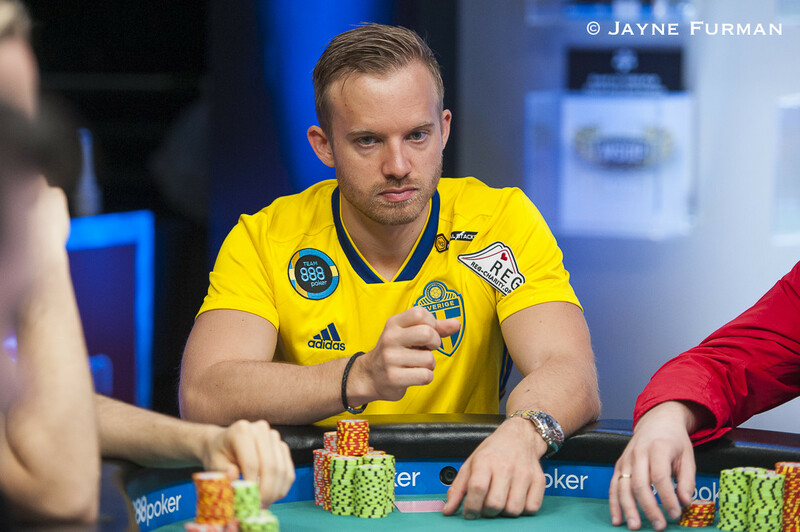 No stranger to big final tables at the WSOP, Anton Morgenstern was next to go. He slipped into the danger zone and got it in with pocket fives when folded to him in middle position. Unfortunately for him, Jacobson called with a bit less, but had him crushed with pocket jacks. Morgenstern couldn’t catch up and he had to settle for seventh when he busted with his last crumbs the very next hand. Chan, who clung to a short stack for a long while, shoved right around ten big blinds with king-three in the small blind. Addamo woke up with queens again and called, finding a queen on the flop to seal Chan’s fate in sixth place. The former Main Event champ busted in fifth place. Jacobson had a rollercoaster of a day, starting out as one of the big stacks with 147 big blinds, but bleeding off after a series of losing pots. The big blow came when he doubled up Paur with king-queen suited from the small blind against Paur’s ace-king in the big blind. The 2014 Main Event champ hung around, though, slowly building, and found kings against Paur’s queens to double up with five left. Jacobson slipped a bit again before getting all his chips in with pocket jacks, calling Lybaert’s four-bet shove from the cutoff, but he was staring right at pocket aces. An ace on the flop gave Lybaert a set, and Jacobson couldn’t complete the runner-runner for Broadway. The Swede finished in fifth place. Paur, despite taking some hits, stayed near the top of the counts for much of the day, until he ran into a cooler of a hand against Addamo. Paur raised under the gun with pocket sixes and called Addamo’s three-bet. He then called down on a board of , the last barrel being for the rest of his stack. His bottom set was no good against Addamo’s for a turned straight, and Paur was out in fourth. That left three deep-stacked contestants with the Belgian Lybaert leading the way. He, Sleet and Addamo were all willing to mix it up and play a lot of pots, and plenty of clashes ensued. Lybaert started running away with it with well-timed aggression working out, but shortly after dinner, the tables turned. Addamo started rising with the help of a few check-raises against Lybaert that got through. Then, Lybaert doubled up Sleet after calling a check-raise, a turn bet and his river shove on an eight-high board holding eight-seven, but was no good against Sleet’s ten-eight for a better kicker. Four hands later, these two got it in again, this time on the flop and it was Lybaert at risk, and behind. 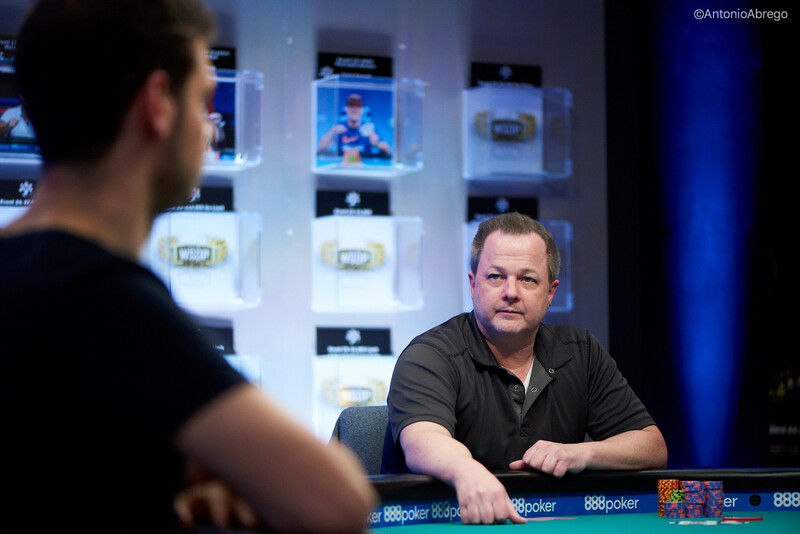 After defending in the big blind, Lybaert saw a flop of against Sleet. Lybaert check-raised and called Sleet’s three-bet jam, needing a diamond or a four to best Sleet’s king-ten. He didn’t find either to make him the third-place finisher. 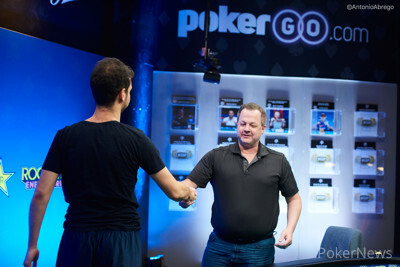 Mark Sleet battled heads-up with Addamo but finished runner-up. Sleet went into heads-up with Addamo with a sizable lead and soon had him on the ropes. Addamo was ahead when the chips went in with on , but Sleet held with plenty of outs. He found one of them on the turn, but the miracle river saved Addamo and brought him back to life. Pretty soon, Addamo was in the lead and after trading pots for a while, Addamo began to extend his lead more comfortably. The two were playing big pots, and eventually, they got all the chips in preflop on a coin flip, Addamo holding ace-king and Sleet with pocket sevens. A king on the flop was all Addamo needed to lock up the win, with Sleet finishing runner-up. That concludes the coverage of Event #24, but there's plenty more World Series of Poker action to follow here on the PokerNews live updates. Hand #233: Mark Sleet shoved from the button for 10,700,000 in total and Michael Addamo snap-called. The board ran out to give Addamo a pair of kings on the flop to take Sleet out of the running in 2nd place. Sleet will take $403,870 home with him for his efforts over the past five long, long days. Hand #227: Mark Sleet raised to 600,000 on the button and Michael Addamo called. The flop was the and both players checked. The turn was the and Addamo checked. Sleet bet 1 million and Addamo let it go. Hand #228: Addamo raised to 400,000 on the button and Sleet defended. The flop came and Sleet checked. Addamo checked back and the turn brought the . Sleet checked once again and Addamo bet 560,000. Sleet called. The river was the and Sleet checked again. Addamo bet 3 million, prompting a fold from Sleet. Hand #229: Addamo got a walk in the big blind. Hand #230: Addamo limped the button and Sleet checked his option. The flop brought and Sleet led 1 million. Addamo called and they saw the on the turn. Sleet quickly fired out 3 million and Addamo called. On the river, Sleet opted to check and Addamo bet 3 million. After a few seconds of thought, Sleet called. Addamo tabled for two pair and Sleet's ten-eight was no good. Hand #231: Addamo got a walk in the big blind. Hand #232: Addamo limped in from the button and Mark Sleet raised to 1,160,000. Addamo reraised to 3,000,000 and Sleet folded. 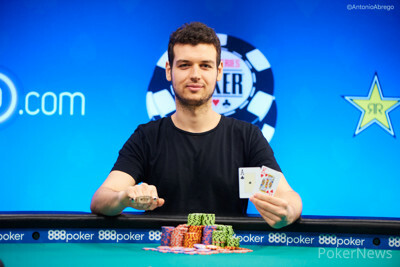 Hand #222: Michael Addamo raised to 400,000 and Mark Sleet three-bet to 1,400,000. Addamo folded. Hand #223: Addamo got a walk. Hand #224: Addamo limped in on the button, Sleet opted to check. The flop came , both players checked to the on the turn. Sleet check-folded to the 160,000 bet of Addamo. Hand #225: Sleet raised to 1,000,000 on the button and Addamo gave his hand up. Hand #226: Addamo raised to 400,000 and Sleet called. The flop came on which both players checked. The came on the turn and Sleet bet 600,000. Addamo folded. Hand #217: Mark Sleet raised to 1 million and Michael Addamo folded. Sleet took the pot. Hand #218: Addamo limped on the button and Sleet checked his option. The flop came . Both players checked and the turn was the . Sleet checked and Addamo bet 240,000. Sleet called and the river was the . Sleet checked and Addamo bet 300,000. Sleet called and they showed down. Addamo showed , but it was no good against Sleet's for top pair of queens. Hand #219: Sleet limped the button, Addamo raised, and Sleet let it go. Hand #220: Addamo completed on the button and Sleet checked his option. The flop was and Sleet checked. Addamo bet 160,000 and that was enough to win the pot. Hand #221: Sleet limped the button and Addamo checked his option. The flop was and Addamo checked. Sleet bet 600,000 and Addamo folded. Hand #212: Michael Addamo raised to 400,000 from the button. Mark Sleet three-bet to 2,500,000 and Addamo folded instantly. Hand #213: Sleet raised to 1,000,000 to pick up the antes. Hand #214: Addamo limped in on the button and Sleet opted to check. The flop came , both players checked to the on the turn. They both checked again to the on the river. Sleet checked. Addamo bet 450,000 and Sleet folded. Hand #215: Sleet raised to 1,000,000 from the button and Addamo gave up his hand. Hand #216: Addamo limped in on the button and Sleet opted to check. The flop came , Sleet check-raised the 240,000 bet of Addamo to 3,000,000. Addamo folded. Hand #207: Mark Sleet raised to 600,000 on the button and Michael Addamo called. On the flop, Addamo checked and Sleet bet 2.5 million. Addamo called and they saw the on the turn. Addamo checked and Sleet moved in for 14 million. Addamo thought briefly and sent his cards to the muck. Hand #208: Addamo limped the button and Sleet checked. The flop was and Sleet bet 1 million. Addamo lets it go and Sleet takes another. Hand #209: Sleet limped on the button and Addamo made it 800,000. Sleet folded and Addamo took the pot. Hand #210: Addamo called on the button and Sleet checked his option. The flop came and Sleet checked. Addamo bet 240,000 and Sleet folded. Hand #211: Sleet raised to 400,000 on the button and Addamo three-bet to 1.8 million. The flop brought and Addamo bet 1.2 million and Sleet called. On the turn, Addamo bet 4.5 million and Sleet let it go. Hand #202: Michael Addamo raised to 400,000 and Mark Sleet folded. Hand #203: Sleet raised to 600,000 from the button and Addamo called. The flop came on which they both checked to the on the turn. Addamo check-folded to the 1,200,000 bet of Sleet. Hand #204: Addamo raised to 400,000 from the button and Sleet called. The flop came , Sleet check-folded to the 280,000 bet of Addamo. Hand #205: Sleet raised to 600,000 and Addamo called. The flop came on which they both checked. The turn brought them the , Addamo check-called the 1,000,000 bet of Sleet. The river completed the board with the , they both checked. Sleet mucked immediately before Addamo could even turn his cards over. Hand #206: Addamo raised to 400,000 and Sleet three-bet to 3,000,000. Addamo folded immediately. Who Will Cross the Finish Line First in THE MARATHON to Grab $653,581?